Luke Lowes (left) and Tommy Smith Morris, a full-service production and integration company with more than 30 years of experience, has added two team members, Luke Lowes and Tommy Smith. 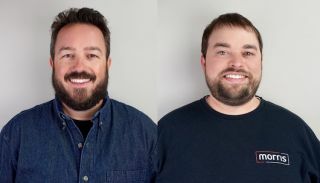 Lowes joins Morris’ production division as account manager, and Smith has been promoted to lighting department manager, also within the production division. Lowes brings more than 17 years of touring and production experience to Morris with acts and festivals such as John Mayer and Austin City Limits under his belt. Lowes has a passion for customer service and will work to develop client relationships, generate new business, and coordinate communication with team members. Smith has been promoted internally from moving lighting tech to lighting department manager. He will manage key operations as they pertain to the Morris lighting department and provide support where necessary for the lighting division. Smith continues to focus on well maintained lighting gear and will guide the lighting department on meeting the creative, technical, and practical demands of Morris’ wide range of clients.